The purpose: ESL at PCPC seeks to reach our neighbors for Christ. We use English classes and free childcare as a way to build community and relationships with people in order to point them to Jesus. We believe that without relationship, we will not have an audience when we talk about our faith. That means that our program focuses on community and relationship, and that when you teach English in your class or care for families through childcare you are acting as a missionary. The details: we offer free English classes two days a week in both the morning and the evening: Monday/ Wednesday from 9:30-11:00am and Tuesday/Thursday from 7:00-8:30pm. The school year is September-May with breaks for all the holidays. We use a very well developed and complete curriculum that is designed for volunteer teachers. The commitment: Volunteer teachers commit to one of the class sessions per week. You commit to preparing for your lesson (very easy to do, given the materials), showing up and teaching to the best of your ability, and praying regularly for the students in your class. The Gospel: We have found prayer to be a very effective way to build community and have the opportunity to speak the Word of God into people’s lives. Bible Studies, conferences, and Gospel presentations at holiday celebrations also give us opportunities to speak of Jesus, but as a teacher, your roll in the equation is to reach out in love and to PRAY. Ways to serve: Volunteer once a week as an English teacher. Volunteer once a week to help in childcare. Teach a short Spanish language Bible study 10 times per semester. Commit to praying for specific needs of ESL students and teachers. Donate gift cards for attendance prizes. Check out Int’l Campus Connections and Lao Presbyterian Fellowship for other cross-cultural volunteer opportunities. Think you might like to teach ESL sometime? We meet Monday and Wednesday mornings, 9:30-11:00 am, and Tuesday and Thursday evenings, 7:00-8:30 pm in the Elementary School hallway below the Sanctuary. Do you speak Spanish and love the Word of God? 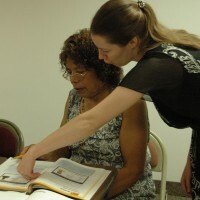 Consider serving our ESL students once a week by teaching from the Bible before or after class. Contact Elizabeth Cunningham with questions or to volunteer: esl@pcpc.org or 214-224-2528.